Shorting Glencore PLC was a painful bet for some hedge funds. 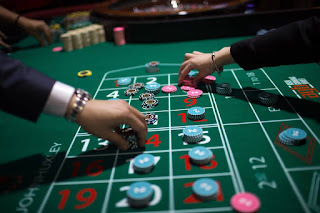 Big-name European funds, including ones run by Odey Asset Management LLP and Lansdowne Partners (UK) LLP, were among those that lost money on big bets against the battered commodities firm. The company’s stock has lost nearly two-thirds of its value this year and slumped in September. But it was up more than 20% in October, leaving some funds on the wrong foot. London-based Odey, which oversees $11.4 billion in assets, had a 19% drop in its OEI Mac fund in the first two weeks of October, leaving it down about 20% on the year as of Oct. 14. Odey’s European fund lost 15.7% for October as of that date, taking losses this year to 16.3%, according to a hedge-fund investor. Mr. Odey said his funds have reduced their shorts, or bets against falling stocks, and had made back some of their losses since the middle of October. As well as Glencore, it has been betting against casino operator Las Vegas Sands, whose shares are up nearly 30% in October, according to a presentation to investors reviewed by the Journal. Mr. Odey said he expects the next downward move in markets to be “much more painful” and is looking for capacity in the economy to be removed—a process hindered by central-bank money printing—before he buys back into stocks aggressively. Energy and commodity markets, and shares in the oil producers and miners exposed to them, have been big losers since the spring. But they snapped back in early October. The MSCI World Metals and Mining index jumped 25% between Sept. 29 and Oct. 9. “It’s been a joyless bounce” for hedge funds, said Antonin Jullier, global head of equity-trading strategy at Citigroup. Lansdowne Partners, one of the world’s biggest equity hedge funds with about $20 billion in assets, had a 5.7% drop in its European Equity fund in the month through Oct. 16, reducing gains this year to 16.5%, according to numbers sent to investors and reviewed by the Journal. Its flagship $12 billion Developed Markets fund is down 1.9% in October as of that date, leaving it up 12.2% this year. Lansdowne declined to comment. According to regulatory filings, the fund has been betting against energy and basic-materials stocks, including Glencore, and against gold and silver producer Fresnillo PLC, which rose 25% in October. “We feel that commodity prices assumed in valuations (especially in energy) are most unlikely to be met,” managers Peter Davies and Jonathon Regis wrote in their most recent letter to investors, which was reviewed by the Journal. The managers said the fund was exposed to sharp reversals in the market. But they added that corporate profits were coming under pressure and they hadn’t put on any new bets on rising stocks of any scale so far this year, while they had spotted at least 10 new attractive bets on falling stocks. Horseman Capital Management Ltd., which runs $2.6 billion in assets, had a 7.9% drop in its Global fund in October as of Wednesday, reducing gains this year to 13.9%, according to numbers sent to investors and reviewed by the Journal. Horseman declined to comment. “I struggle to contain my bearishness,” Horseman fund manager Russell Clark said in an October letter to investors, also reviewed by the Journal, adding that he believed a global recession had already started. The fund has been running a large bet against stocks, including bets against those in the oil, financial and auto sectors. Hedge funds on average are up 1.1% for October but down 2% this year to Oct. 27, according to early numbers from data group Hedge Fund Research. That puts them on track for a third calendar year in the red since the onset of the credit crisis. Equity hedge funds, which are typically able to capitalize on rising stock prices, are up just 1.1% for the month to Oct. 27, compared with a 7.6% gain in the S&P 500 over that period. They are still down 2% for the year. Despite a bad month in October, I'd say that Lansdowne Partners and Horeseman Capital are doing incredibly well compared to many other top hedge funds that are experiencing a brutal year. 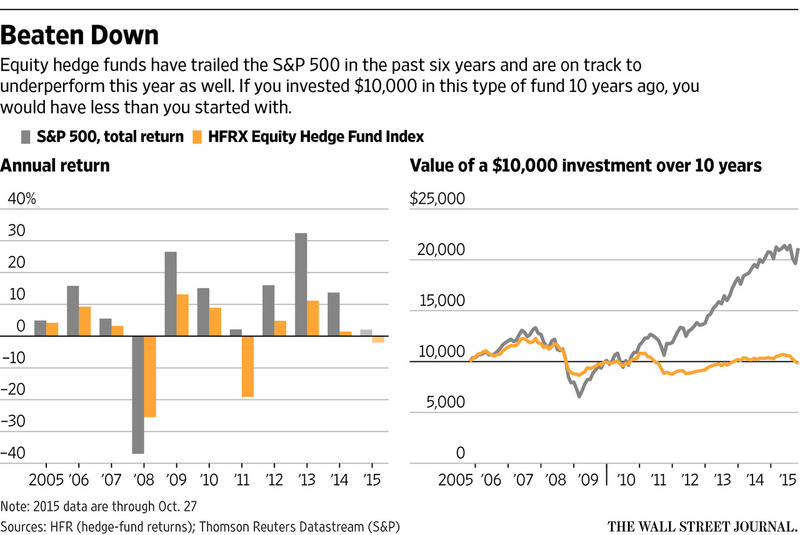 For some large U.S. hedge funds, October may be replacing April as the proverbial cruelest month. Last month brought an 8.4 percent rally in the S&P, the best performance for that and other major indexes since 2011. Yet while average hedge-fund performance figures haven't yet been tabulated, anecdotal evidence suggests that some major money managers struggled to even come close to those levels. Through Oct. 27, Pershing Square, the long-short hedge fund managed by Bill Ackman, had fallen 3.8 percent for the month, according to its website, and was down 15.9 percent this year. Through Oct. 26, Glenview Capital, the health care-oriented fund run by Larry Robbins, was down 7.3 percent for the month and 20.25 percent for the year, according to an investor letter, prompting Robbins to show remorse for a period that in which "I've failed to protect your capital, and mine." In an effort to rebuild investor goodwill, Robbins is offering to "work for free to recover the losses I created for you" by initiating a new, fee-free investment product that focuses on more easily-traded stocks. Other key funds had flat or upside performance for October, but still fell shy of the broad market — and remained in lackluster territory. Greenlight Capital, David Einhorn's long-short stock fund, managed 0.7 percent returns for October, but remained 16.3 percent in the red for the year. Dan Loeb's Third Point Offshore fund did better, rising 4.7 percent in October but staying flat for the year through then. Even Citadel's flagship Wellington fund, which is up an impressive 12.15 percent for the year, was flat for the month. Some hedge-fund managers remain optimistic, while acknowledging that their clients may be disappointed with this year's showing. In a late-October letter to investors, for instance, Einhorn spoke of re-examining his losing positions and electing to reduce Greenlight's gross exposure, covering some short, or bearish positions, and "modestly" increasing the firm's net long positions. The fund continues to see future upside in some of its more battered holdings, including Consol (CNX) and SunEdison (SUNE), Einhorn wrote. Loeb, however, went the opposite direction, saying in an Oct. 30 letter that the short-selling environment was full of opportunity and that Third Point has "more single short names than long positions in our book today." While Loeb said he he does not see another U.S. recession as imminent, the market will remain volatile and stock valuations will be curtailed. Even Seth Klarman’s $27 billion Boston-based hedge fund declined about 3.8 percent in September, bringing its loss to about 6.6 percent for the year through the end of September. And as if things aren't bad enough, the Wall Street Journal reports a bill requiring hedge funds to disclose their holdings more frequently was introduced in Congress on Wednesday, a move that if signed into law would represent a seismic change for the hedge-fund industry. Yup, things aren't going well for a lot of fabulously rich and famous hedge fund managers which are taking a huge beating this year. And the hits keep on coming for Pershing Square's Bill Ackman whose long and short positions are getting killed. This is hardly inspiring his investors who had to sit through a four hour conference call and effectively cannot redeem from his fund even if they wanted to. His fund has a very tight redemption policy which allows investors to take out roughly 12% every quarter (they should have followed Soros and bailed a long time ago). But while Ackman’s big bet on Valeant Pharmaceuticals has been the biggest drag on his 2015 returns, others wisely steered cleared of this company or unloaded at the right time. The drugmaker's shares had been a big performance driver for Rosenstein's Jana Partners. The fund first bought 4.3 million shares of Valeant in the fourth quarter of 2014. In spring 2015, the fund pared back its position to 1.57 million shares. Jana held 1.34 million shares of Valeant at the end of the second quarter, regulatory filings show. His September exit came at the right time. When the facts do change, we react. 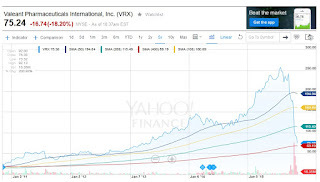 A case in point is Valeant Pharmaceuticals International, INC (VRX). We established our position in the fourth quarter of 2014, and closed out the position in September. Year to date, Valeant has been the biggest positive contributor to performance. The situation for Valeant changed dramatically in September, when its drug pricing practices were called into question by Hillary Clinton. Valeant had been under scrutiny for months, and in retrospect we should have been more acutely attuned to the importance of the inquiry into the price increases on certain Valeant's drugs by Senator Sanders and Representative Cummings that surfaced in August. We had reduced our Valeant position meaningfully earlier in the spring and summer as it approached our price target, and we felt more comfortable with our smaller position. When Valeant's business practices were conflated with those of Turing, whose founder painted himself and his company (and by extension Valeant) as a nearly political target, we recognized that Valeant's business model would be forced to change in ways we could neither anticipate nor forecast and decided to exit completely, thereby avoiding an approximately 40% further drawdown in the stock. Valeant had been a hedge fund favorite, but lately it's been a hedge fund horror. It ranked No. 10 on Goldman Sachs' stocks that "matter most" to hedge funds list for the second quarter. According to Goldman, 32 funds had the stock as one of their top-10 stock holdings. Some of the stock's big holders include Bill Ackman of Pershing Square and long-time activist investor Jeff Ubben of ValueAct. Ackman, founder of Pershing Square, has lost around $1.9 billion on paper since taking a large stake in the first quarter of this year. Unfortunately for Barry, while he was smart enough to ditch Valeant at the right time, Jana Master Fund fell 8.2% in the third quarter, bringing the fund's year-to-date losses to 6.7%. Still, the losses would have been dramatically worse had the fund held onto its Valeant shares. The story of Valeant Pharmaceuticals has come full circle. The charge is that Valeant, a pharmaceutical company that has been one of Wall Street's darlings over the past several years, is a roll-up — a company that uses aggressive accounting and serial acquisitions to hide its lack of growth. Now that Valeant's shares have been crushed and bond investors have grown wary of the drugmaker's $31 billion debt load, this view has been given more credence. Standard and Poor's on Friday downgraded its outlook on Valeant's credit to negative. It's not that Wall Street didn't know that Valeant — whose annual revenue is over $8 billion — was aggressive, it's that now investors are starting to ask themselves why. And now that government officials at both the federal and the state levels have started asking questions, investors are starting to wonder whether Valeant's aggression will stand. Last week, one of Wall Street's elder statesmen, Berkshire Hathaway vice chairman Charlie Munger, told Bloomberg thatValeant had relied on "gamesmanship" to show value and had a "phony growth record." I must admit, while it's tempting to follow Ackman and buy Valeant shares here, the chart is broken and even though you can make huge gains trading it, you're always worried of the next shoe to fall. Is Valeant the Enron of pharmaceuticals? Maybe not but it looks a lot like the Nortel of pharmaceuticals and a lot of large and small Canadian investors got burned badly buying the dips on that stock. We shall see, a lot of hedge fund bets have gone awry this year and I'm glad I'm not allocating to any of them because I'd be ripping them apart here and definitely not be sitting in a four hour conference call to listen to lame excuses as to why their fund is down 20%+ YTD. Since a lot of you hedge fund honchos are reading me, let me just bluntly state your performance really stinks this year and I think some of you really need to reevaluate your process and especially your risk management. It's one thing trading biotechs and other shares for your personal account and experiencing wild gyrations but when you're a fiduciary responsible for institutional money coming from public pension funds -- and charging 2 & 20 to boot! -- I don't know how you can look your investors in the eye and tell them, "stick with me, it's just a bad year but everything is fine." Honestly, I would be embarrassed to write the stuff some of these hedge fund gurus are writing to their investors or to recite pathetically lame excuses explaining away their terrible performance, let alone subject them to a four hour conference call!! But I blame institutional investors who are ignorant and clueless and didn't see this latest shakeout in hedge funds coming. A lot of public pension funds have no business whatsoever investing in hedge funds, trying to be pension fund heroes picking top funds. In this environment, I wish them the best of luck. Those allocations are generally in the high single digits and can be as much as 20 percent, Bruce Amlicke, CIO at UBS Hedge Fund Solutions, said in an interview in Singapore. Five years ago, that share was “a couple of percent less,” he said without elaborating. Ironically, if I'm right and there is no end to the deflation supercycle, bonds will still outperform most hedge funds going forward, especially on a risk-adjusted basis. Below, Edmund Shing wants you all to avoid hedge fund horror and invest in Aberdeen Asset Management. I don't agree with everything he says as he's talking up his business but listen to his comments on why fees matter a lot as well as why investors are better off in Man Group's shares. Also, CNBC's Kate Kelly takes a look at the early end-of-the-month numbers for some well-known hedge funds and weighs in on what's next for both the funds and the markets. Third, Morgan Creek Capital CEO Mark Yusko and Western Asset Management Deputy CIO Mike Buchanan discuss the performance of hedge funds versus college endowments. 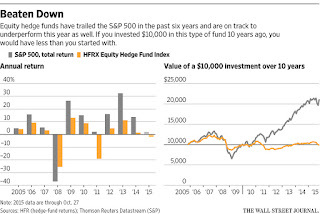 This is a great discussion which shows you why endowments and pension funds with a longer investment horizon are able to deliver better returns than hedge funds that "don't hedge." I just hope that the subprime unicorn boom in tech doesn't turn out to be a bust for endowments. Finally, let me end by plugging a Canadian L/S Equity manager who is delivering a solid performance. Martin Lalonde of Rivemont Investments had an exceptional third quarter and even though he's managing a relatively small fund, I like his long and short trading ideas on North American equities and would urge all of you to call him and start tracking his performance closely. This is also a good time to remind many of you to please take the time to donate or subscribe to my blog and show your support in bringing the very best insights on pensions and investments. You can do so using the PayPal options at the top right-hand side of this page. I thank all of you who are supporting my efforts and look forward to seeing others join them.